Former enterprise minister Jonathan Bell has denied he opposed a two-week extension to the closure of the RHI scheme because it made him look foolish. He was speaking during his second day of evidence to the public inquiry into the flawed energy scheme. Mr Bell had already announced the scheme would close with immediate effect on 5 February 2016. But the final closure of the scheme did not happen until 29 February 2016. The decision to extend the scheme for a further two weeks was taken in Belfast following an angry reaction from boiler installers, while Mr Bell was on a trade trip to Canada that weekend. When he returned on Monday, he was told then-First Minister Arlene Foster wanted a short extension as the "needs of industry" had to be taken into account. RHI inquiry counsel David Scoffield QC said several witnesses including Mrs Foster, her chief special adviser (Spad) Timothy Johnston and Mr Bell's own Spad, Timothy Cairns, had all offered an alternative suggestion for his opposition. He said they had claimed Mr Bell's real concern was "not so much public finances, rather the fact that changing your position so soon after you announced the decision would be something which looked like a political u-turn". They had suggested it would be "personally embarrassing" for Mr Bell and would make him look foolish and allow political opponents to make capital from it. Mr Bell said it did make him and "the rest of the party" look foolish, but he believed it was a foolish decision and the wrong one. He said the main reason he opposed the extension was to be "a proper steward of public funds". The inquiry was later told Mr Bell's permanent secretary Andrew McCormick was "relaxed" about this extension, because anyone who availed of it was on much less lucrative tariffs after they had been cut the previous November. 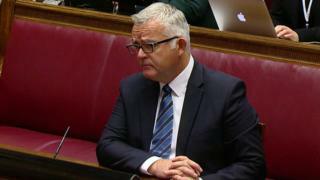 Mr Bell was asked if RHI was the only cause of tension between himself and Arlene Foster in a "heated exchange" over the potential scheme extension. He said there had been other issues between them in the previous two months, but did not give any details. The pair had been close when they were students at Queen's University in Belfast and Mr Bell had relied on Mrs Foster for advice in the past, he added. He repeated a claim he first made to the BBC's Stephen Nolan in December 2016, in which he said Arlene Foster had personally instructed him to keep the scheme open for a further two weeks. He told the inquiry, the atmosphere during their meeting had been "abusive". The inquiry team said that stood in contrast to Mrs Foster's claims, as she said Mr Bell had been the one who had been "aggressive" towards her. Later, Mr Bell was asked seven times by the inquiry chair, Sir Patrick Coghlin, why he had secretly recorded a conversation with his former permanent secretary, Dr Andrew McCormick in 2016. Mr Bell said he wanted to have a "valid record of what my concerns were", explaining that he was concerned that Spads had interfered to keep the RHI scheme open after he tried to close it. He told Sir Patrick he regarded Dr McCormick as a "person of integrity", but that as he was no longer enterprise minister he wanted to have his own account of events, as he could not access information as easily now from the Enterprise Department. Earlier in Friday's hearing, Mr Bell was asked if he had been aware there had been a spike in applications at a time when DUP ministers, including him, were out of office as part of a protest following the murder of Kevin McGuigan, which was blamed on the Provisional IRA. He said it was a "concern" that it was not made clear to him by departmental officials, that the spike was happening while he was moving in and out of the executive during September and October 2015. Mr Bell accepted that when he realised the significance of the delay in the introduction of cost controls, he should have asked serious questions. A large spike in applications to the scheme in a four-week period in autumn 2015 had the biggest impact on the public purse. Mr Bell did not bring cost control regulations to the assembly for approval until mid-November. He said by that time, he knew about the increase in applications and its huge associated cost. He told the assembly the scheme had been a good one with benefits to the Northern Ireland economy, which now needed to be restricted because of increased uptake. But the inquiry panel said that, in the background, he knew of the financial consequences of the delay. Sir Patrick also queried why Mr Bell had not asked "serious questions" of his officials about the financial fallout from the delay, during which there been hundreds of boiler applications. Mr Bell had not done that, but acknowledged that he ought to have. He said while the civil service had accepted the delay, it had not been their idea. In December 2016, Mr Bell went public with claims that when he attempted to close the RHI scheme, he was stopped by DUP special advisers (Spads) from doing so. The inquiry team asked why, a year earlier when he learned of the delay's impact, he had not gone back to those Spads in the party he now blamed for it, to point out the consequences of their actions. Mr Bell said as plans were made to shut the scheme in early 2016, his Spad Timothy Cairns told him there would be resistance from within the party - and that Mr Cairns said other advisers were opposed to the idea. He was asked by the inquiry whether this was because of claims that some of them had private or family interests in the poultry industry who were major users of biomass boilers. Mr Bell said Mr Cairns told him the opposition was based on a number of factors. "He said that it was a popular measure. It would have a political impact. "It would attract a lot of criticism for us doing it and people were very politically aware of the damage it would cause to deal with it." Mr Bell said the party wanted to support agriculture and was keen to support farm diversification which would help "keep the rural economy strong". Also during Friday's hearing, Mr Bell was asked about attempts to close the scheme to new entrants in early 2016. As plans were being worked up, officials became aware that Moy Park was telling boiler installers that a closure date of March was being considered - and to speed up their applications. The inquiry has already heard suggestions that Spads could have been leaking the information. Mr Bell said he had no knowledge of that happening, but added if it was, those responsible "were doing Northern Ireland a gross disservice". The inquiry heard that when officials first produced closure plans, Mr Bell's Spad Timothy Cairns asked whether the Ulster Farmers' Union could be consulted. He was told it would be inappropriate. Mr Bell said the scheme needed to be closed to manage the budgetary pressure, after it became clear that Treasury would not pay for the huge overspend. "There is no legitimate reason why in these circumstances that you would advertise for more people to come into the scheme," he said. On 22 January, 2016, Mr Bell signed off a submission that would have seen the scheme close in early to mid March, in line with the rules on public and assembly consultation periods. But his approval was pulled after his Spad, Mr Cairns, sent the submission to Timothy Johnston, a Spad in the first minister's office. Mr Johnston intervened because the plan had to come to the executive for approval. The inquiry heard Mr Cairns was issued an instruction by Mr Johnston that nothing further was to be done until he had cleared it with the party, so the submission was rescinded. Mr Bell told the inquiry he was preparing for a US trade mission when his approval was reversed and that it had been done without his permission. But Mr Cairns claimed he told his minister what had happened and while they considered that Mr Johnston had dealt with it in an "unprofessional" manner, Mr Bell had been aware of the decision had been taken. The former minister contradicted that claim and said he had been told no such thing; that he had never withdrawn his approval and no-one had the authority to overrule it. He could not explain why his Spad would have made up a claim that he had been told, he added. Counsel to the inquiry David Scoffield said it was "curious" that everyone else, including civil servants on the US trip, appeared to know what was going on, but Mr Bell did not. At the start of Friday's hearing, inquiry chair Sir Patrick warned it must not be treated as a platform for publishing "sensational" claims for the media. He said the public hearings did not afford an "open invitation" to witnesses to come along and refer to material to which they objected, but which was outside the scope of the inquiry. It followed claims about a DUP-inspired "smear campaign" against Mr Bell, which he raised during his first day of evidence on Thursday. Sir Patrick said he was not suggesting the documents referred to in respect of that by Mr Bell "fell into such a category". He said he was making a general point that "this inquiry is not a media sensationalist platform so I would be grateful if everyone could bear that in mind". Ending his two-day session at the hearing, Mr Bell was asked if he felt there was any way in which he had let people down during any of the events that had transpired. "Any faults the panel finds as a result of my failings, I will offer a full, frank apology - unequivocally - for any of my faults," he said. He said he had achieved his two aims - protect the public purse and achieve a public inquiry into the scale of the flawed RHI scheme. Sir Patrick then thanked Mr Bell for coming to the inquiry, and said it was "not an easy task" to deal with some of the panel's questions. Next week, Mr Bell's former Spad, Timothy Cairns, and Arlene Foster's former Spad, Andrew Crawford, will appear before the RHI inquiry.